This is not so much an autobiography as a collection of anecdotes and accounts of those who work in this field, sprinkled with examples of good and bad use of language and its grammar with an ultimate shrug of the shoulders, as if to say: Who gives a flying duck? The ebb and flow of this entertaining work reminds me of the writings of Bill Bryson – musings more than exposition. Mary Norris is often funny – tongue in cheek – and at times serious about the process of correcting another’s written work. She is in awe of some authors and scathing of others. She also draws wonderfully sharp portraits of people she has worked with (should that be ‘with whom she has worked’?). While regretting that the English language is changing in some unfortunate ways, Norris also acknowledges that some change is inevitable. She explains that ‘between you and I’ is just plain wrong, and why it is; she also puts forward a theory of why so many people now use this phrase. 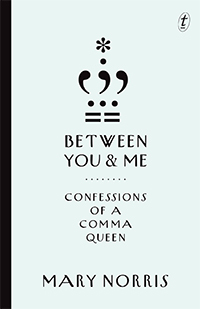 There is plenty of meat in this book for anyone working in editing: examinations of punctuation, hyphenation, gendered personal pronouns, the greengrocer’s (or greengrocers’) apostrophe and the use of profanity. Writers will find much to remind them of what they have forgotten from their high school English grammar lessons – if they ever had any. The wonderful thing about Norris is that she doesn’t take herself too seriously and she has no expectation that the reader will take her too seriously either. She draws curtains back from a window through which few people ever get to peer and the scene is enlightening and irreverent.